Most folding phone news has been focused on Samsung and the company’s long-rumored Galaxy X, but Samsung isn’t the only manufacturer that’s seemingly working on folding handsets, and a newly published patent suggests LG could be well on the way to launching a folding phone too. The patent was published in Korean and unearthed by Dutch site GSMinfo, so as we’re linguistically challenged firm details remain unclear, but the images show a device that we’d like to get our hands on. LG’s concept has a clamshell design, where the screen can fold out to twice the size, but where a traditional clamshell phone and some of Samsung’s folding phone ideas put the screen on the inside so that it’s covered when the device is closed, LG’s patent shows a display on outside, so the screen is fully usable whether folded out or not. 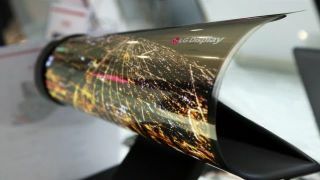 As such when it’s folded it can be used like a conventional smartphone, albeit one with potentially no bezels, and when unfolded it’s more the size of a small tablet. We should point out that there are thousands of patents and many of them never become more than a document, but this at least shows LG’s possible vision for folding phones. While it may have only just been published, the patent was apparently filed 18 months ago suggesting LG could be well on the way to turning its concept into reality if it has been working on a folding phone since then. And this isn’t the only evidence that LG could have a foldable handset on the way soon, as another recent rumor suggested that LG plans to produce 100,000 foldable devices towards the end of the year. With the foldable Samsung Galaxy X also rumored for a 2017 launch this could well be the year our folding fantasies become a reality.